Any other college students wish days were slightly longer or your weekends had an extra day? If you answered yes, then you are not alone. But there are things you can do to add some time back into your day and make the most of the time you have. Today I am sharing 8 things that I have learned throughout college that help me make the most of the 24 hours I do have every day! Try to block your classes together if possible and don’t leave large chunks of time between class. If a break between classes is unavoidable, make a plan on what you will do during that time every week. Even a 30 minute break can be used to run through a Quizlet, proofread a paper, or even take a power nap. Isn’t there a quote out there that says you always have time for what you prioritize? Well, I would say that is mostly true. Yes, you want to balance everything and have fun, but honestly school should be your #1 priority while you are in college. Go to class, take good notes, and turn in assignments on time. I am a total Type A, list-making type of person. But even if you aren’t, I still highly recommend investing in a planner you love. The best way to stay on top of everything is to write it down so you don’t forget it. During the first week of classes, write down any important dates from your syllabus in your planner. I promise you will thank yourself later! In college it can be so easy to forget about yourself, especially when you schedule things into every minute of your day! But don’t forget to schedule in time for yourself and for your friends too. Schedule in coffee to catch up with a friend, or a study date with someone else. One way I do this is to make sure I have time over the weekend to paint my nails. It only takes like 30 minutes and I usually do it while listening to a podcast to give myself a break and do something I enjoy. Some people cannot study in their dorms. Some people can only study in the library. Some people (like myself) cannot stay in one spot and have to move around every few hours to stay productive. Try out a few spots during the first week and see what works best for you! The past three years have taught me that I need to find a place where people are around so I feel like I have to work on things, but not so many people that I get distracted people watching! It can be so easy to say that you are going to watch Netflix while you study, but ultimately it will end up taking longer. The only time I multitask while I am doing schoolwork is if I am making flashcards. For my anatomy class freshmen year, I made about 100 flashcards every week after lab. This was pretty boring but ultimately helped, so I usually watched something to pass the time. Yes, I might’ve finished a bit sooner if I was solely focused on the flashcards, but honestly it is a mindless task that I could do while watching something else. In college there are so many clubs and activities are offered. While it is great to take advantage of opportunities, be careful not to commit to too much. Select a few things that you want to focus on (getting good grades, working out, a club, a social life, etc) and excel at those few things. While it might sound cool that you are a part of four organizations on campus, the fact that you only get 5 hours of sleep every night from overcommitment isn’t cool at all. As a blogger, I am on social media just as much, if not more, than the average person. But when I know I have a busy week, I will delete my apps or move them to the back of my phone. During finals last spring I moved Twitter, Instagram, and Facebook into a folder on the last page of my phone. Multiple times I found myself opening my phone and clicking on the spot where they used to be! But it helped me to stay off of them, and I would only get on and quickly scroll through for 5 minutes during dinner or before bed. 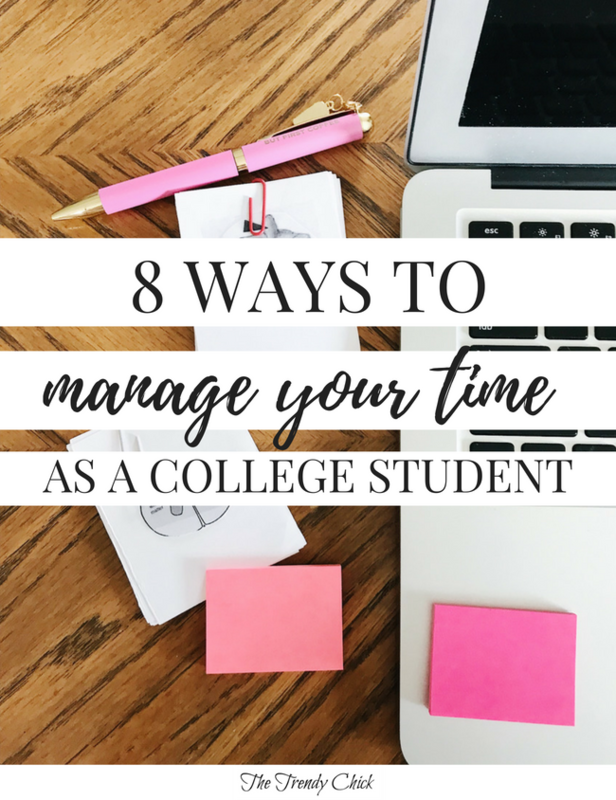 How do you make the most of your time in college? Share your tips below!